Whether you are part of the green movement or just looking to save up some money on your utility bills, it seems that reducing energy consumption is top of mind for many people. Even minor changes to your routine can reduce power usage and lower your costs. Not only is this good for your wallet, but it’s also good for environmental sustainability. See ten easy ideas you can implement in your household to reduce energy consumption and increase efficiency. Heating, Ventilation, and Air Conditioning (HVAC) systems are the largest culprits when it comes to energy use in your home. Over time, normal wear and tear on your system will lead to less than optimal performance. For example, moving parts may start to lack lubrication, causing friction and making your system work harder to heat or cool your home. Tune-ups will correct these types of issues and optimize the efficiency of your system, resulting in lower energy usage. Your heating, ventilating and air conditioning filter is of particular importance during high-usage months like winter and summer, when temperatures are above normal. A dirty filter impedes air flow and puts more strain on your system. If it appears to be dirty and does not work properly, replace it right away. Automating usage when you are out of your home or while you are sleeping is a critical step. According to Energy Star, proper use of a programmable thermostat can save you up to approximately $180 per year in energy costs. If you don’t have a programmable thermostat, be sure to adjust your temperature settings manually when leaving the house. Ceiling fans can make you feel cooler in the summer, allowing you to set your thermostat a few degrees higher. Conversely, in the winter, you can reverse the direction of your fans to force warm air (which rises to the ceiling) down into your living space. Just be sure to turn them off when you leave the room. You will neutralize improper waste. The water heater is the second biggest source of energy usage in your home (second only to the heating and cooling system). If you have a newer water heater, it is probably adequately insulated. Older models, however, may not be. Heat loss through the walls of the tank can be significant, and this translates to greater energy use and higher bills. If your hot water tank feels warm to the touch, it could likely benefit from additional insulation. Wrapping your water heater with an insulating blanket will slow heat loss, thereby conserving power. Many manufacturers set the thermostat on a water heater to 140 degrees; however, most households can function adequately at 120 degrees. Lowering the temperature will reduce the amount of energy used to heat and maintain hot water. If you go on vacation, consider lowering the temperature even more while you are away, and turn it back up when you return. Reducing hot water use will place less demand on your water heater and lead to greater energy efficiency in your household. Make sure to only run the dishwasher when it is full. Install aerating or low-flow faucets and shower heads. Fix any dripping faucets, especially those leaking hot water. These easy steps will significantly reduce your water usage. Making the switch from incandescent to CFL or LED light bulbs will help you tackle another prime source of power usage in your home. According to Energy Star, one energy efficient light bulb uses 70-90% less power and can last up to 10-25 times longer. 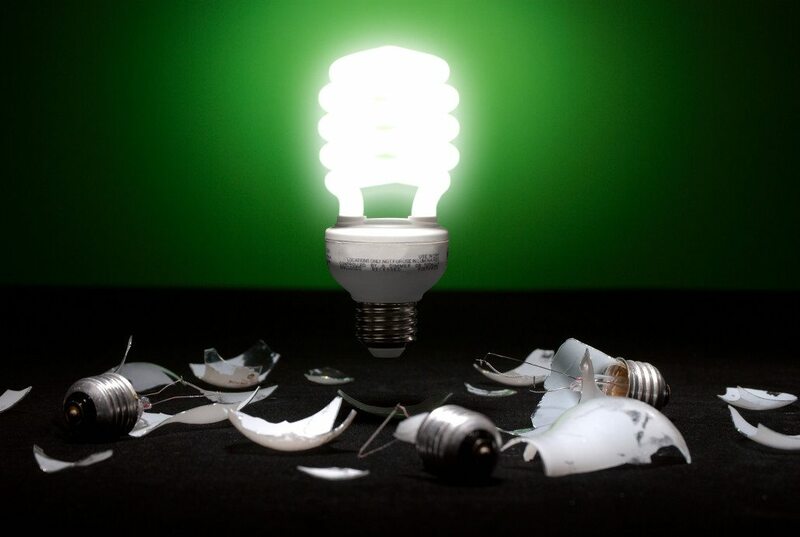 When replacing CFLs, be sure to recycle them as they contain mercury and must be disposed of properly. Vampire power, also known as phantom load, is the power used while electronics and appliances are sitting idle. Even when turned off, devices like televisions, cable boxes, printers, and coffee-makers all use something called standby power. This allows devices to power-on quickly and provides power for text or clock displays, for example. The U.S. Environmental Protection Agency introduced the Energy Star program in 1992. This voluntary labeling program helps consumers identify energy efficient products that can reduce your carbon footprint, get you closer to environmental sustainability, and help you save on utility bills. Products included in the program include major appliances, insulation, roofing, computers, lighting, and much more. Whenever you have to replace something in your home, look for a product that is Energy Star certified. Not only will these products help you lower your power bills, but you can also benefit from tax credits and deductions for using such energy efficient products. Be sure to check with a tax professional to take advantage of these credits on your tax return. Walker Reid Strategies is here to help on such matters. Contact us and we will assist you with this process.